The best things in life are often passed down from one generation to the next and “Greek Pittes” are living proof of that! This cheese pie or “Tiropitta” was shared from my friend Eleutheria who is an amazing cook. 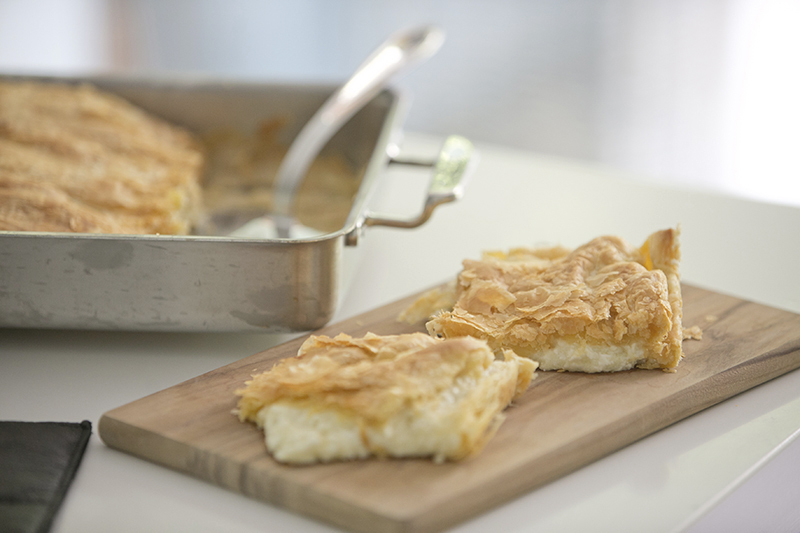 It is a quick and easy recipe prepared with ready-made fillo pastry, a creamy semolina base and a spicy mixture of Feta cheese and Kasseri cheese: This is a Greek sheep’s milk cheese with a sharp salty flavor that can be substituted with Pecorino Romano, Scarmorza or Kefalotyri, also a Greek salty cheese made from sheep’s or goat’s milk. 1. This recipe is for 40 cm in diameter baking pan. 2. For the semolina mixture Pour the milk into a small pot. Place it over a medium heat and wait a few minutes for it to warm up (don’t let it boil). 3. Add the semolina and whisk constantly to avoid lumps. When the mixture starts to thicken, remove it from the heat, add the cold butter and stir until it is incorporated. Add nutmeg and mustard powder. Stir. Set aside and let it cool completely. 4. For the cheeses Mix the Feta and Kasseri cheeses together. Beat the eggs and add them to the cheese mixture. Season with pepper and mint and set aside. 5. For the puff pastry Flour your work surface. 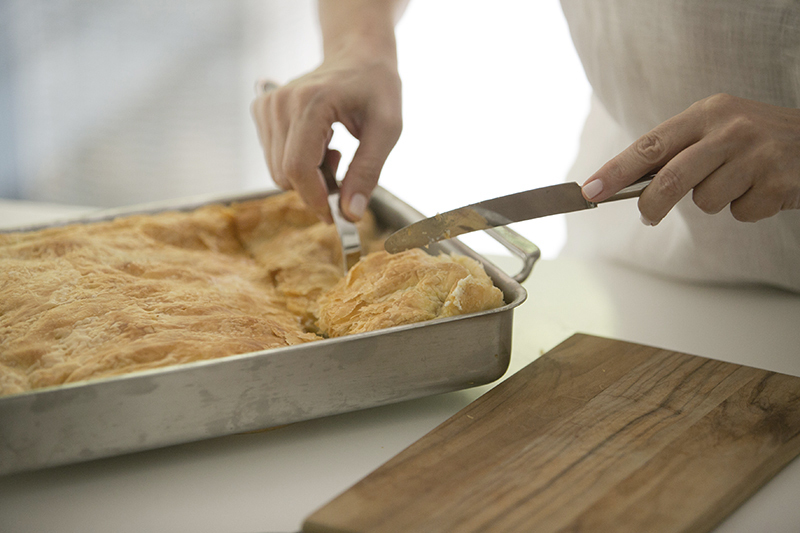 Remove the first piece of dough – what will be the bottom sheet – from the fridge and roll it out to form a round pastry sheet (frozen prepared sheets may be used). 6. Place the sheet on the bottom of the pan. 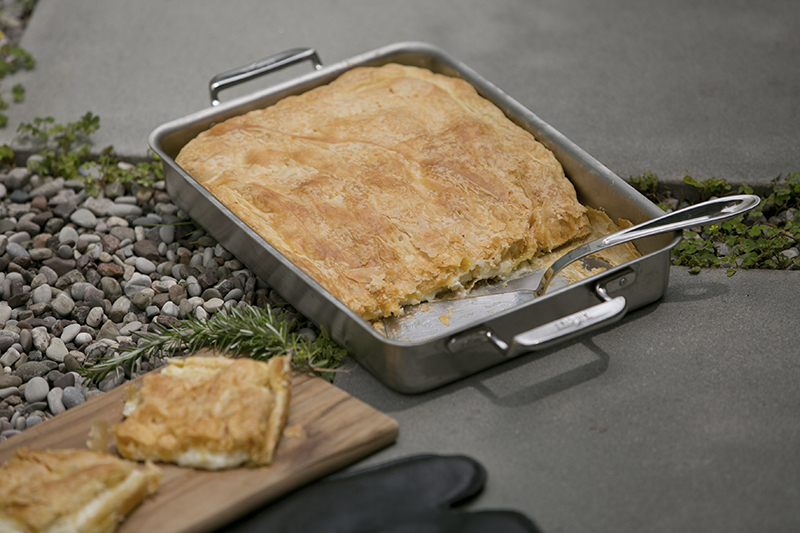 Note: The bottom pastry sheet must be a little larger than the 40 cm pan; it has to reach up and cover the pan’s sides in order to contain the cheese filling. 7. For the filling Add the cooled semolina mixture to the cheese mixture and stir. 8. Spread the filling over the bottom sheet. 9. Roll out the second piece of dough. The sheet should be exactly 40 cm in diameter, just to cover the filling. Use your rolling pin to transfer the sheet easily. 10. 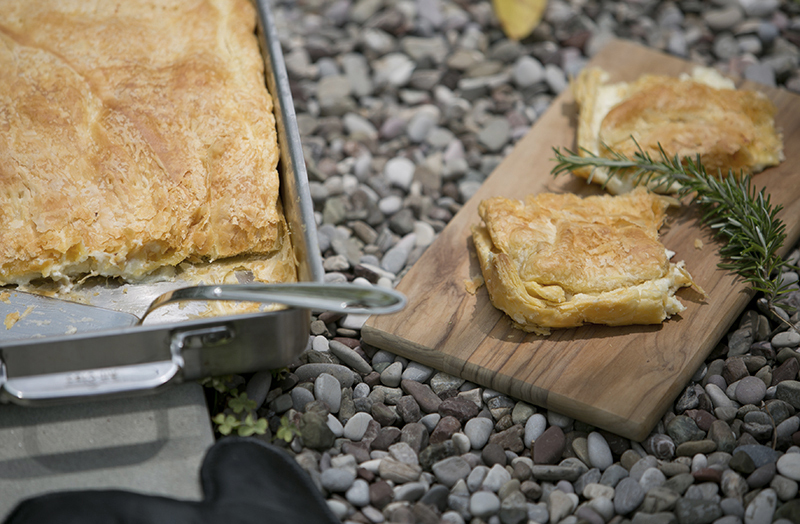 Fold and press the edges together with your fingers, to seal – and decorate – the cheese pie. 11. With a sharp, pointy knife, carefully score the pie into serving-size pieces but just the top layer of pastry – i.e. don’t cut all the way through to the bottom! By doing this you create vents which allows the steam to escape while cooking. 12. Brush with olive oil. Bake the pie on a lower shelf in a 180°C (350°F) oven, for 45 to 50 minutes, or until it turns golden brown.